It was fascinating to read Errol Morris’ series of posts on the ethics of photojournalism in reference to FSA photographers. 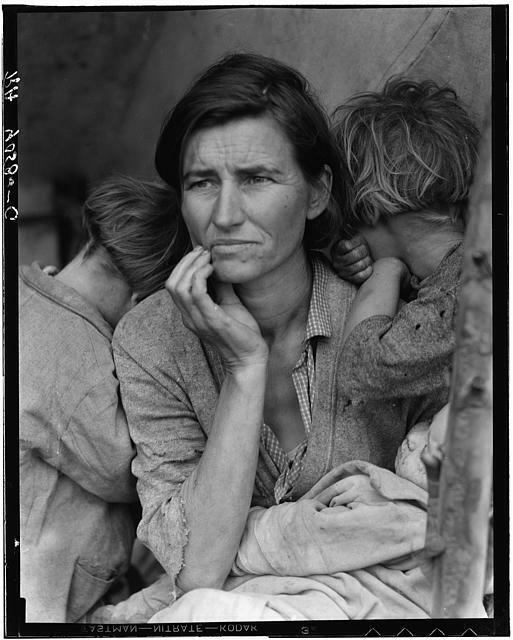 Morris looked at Arthur Rothstein’s and Walker Evans’ most controversial photos from nearly as many angles as Edward Steichen photographed his cups and saucers. Morris engaged the photos and photographers in an attempt to get at their core ethics and answer the question: what does photographic evidence mean? This article contrasted interestingly with the spirit behind the Lynda.com tutorials on digital photo editing. Morris admits that photoshopping images is only one of the newest forms in a long line of techniques to use photography for political purposes. Interestingly, the Lynda.com tutorials, especially the tutorial on photo restoration, are not trying to allow an editor to change a photo for their own purposes, but to present what the original photographer would have wanted to convey. By stripping the damage that time has done to a photograph, the editor can extract the essence of the original. Morris’ series also impressed on me, how important a sense of ethics around web images is to any historical website I create. Rothstein and Evans were trying to tell particular stories, though felt they presented their subjects fairly. Many in America strongly disagreed and as a result, Rothstein, in particular, was discredited. As Morris concludes: “It should not be lost on any of us that these controversies are still with us.” It’s an important lesson for all historians on the web. Good post, Peter, though I wonder if Evans was thinking about politics when he placed the clock on the mantle, pulled the beds from the wall and pushed the rocking chair against the banister. He was an artist first and foremost and wanted the best photograph possible. You could even argue that if his political aim was to show the devastation of poverty, adding a clock would have worked against his goal. Rothstein was a different case, but I’m not so sure I would have been so noble at age 21 as to abstain from touching that skull even if I thought moving it ten feet would make the photograph, and my career. I definitely am not that noble now. Attribution is a whole other can of worms. But I agree the issues with authority/argument are inherent in both. I’m partial to the Lee Harvey Oswald, Jack Ruby Band fake. Rob, I think your point is well taken about Evan’s intentions (and Rothstein’s to a degree). He was much more of a “true” artist/documentarian than the other photographers, at least in Morris’ telling. I do buy the theory that the alarm clock really did belong to the Grudgers and that it was accidentally missed in the inventory. Beds and rocking chairs moved slightly… Not so sure I side with Evans. I know “God put it there” in his mind, but recall of noble details works in funny ways (I’ve done enough oral histories to know about “factual” recollection decades after the fact).